Congratulations to latanya t, winner of the book! Welcome to the 75th All Things Paper giveaway! I'm finding that big number hard to believe, but of course time flies when you're having fun... introducing new things in the world of paper continues to be something I love to do. 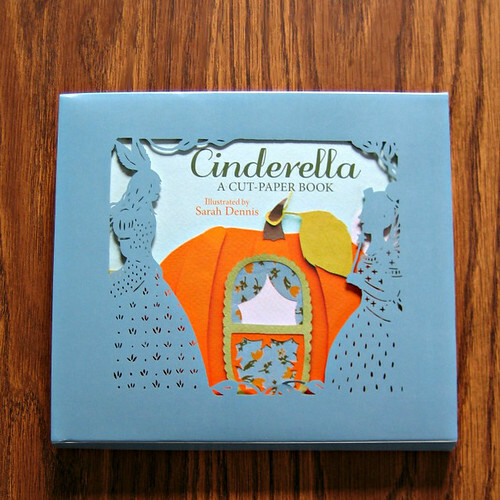 Artist Sarah Dennis collaborated with Tango Books Ltd, London to create a cut paper keepsake version of the beloved Cinderella fairy tale. This 52-page edition was first released in the UK in 2013 and is now making its way to the U.S. where it will be available on April 1, just in time to be a non-sugary, yet sweet addition to Easter baskets. Admittedly the book might not have the dazzle and dash of the new Disney movie, but it's a charmer nonetheless. 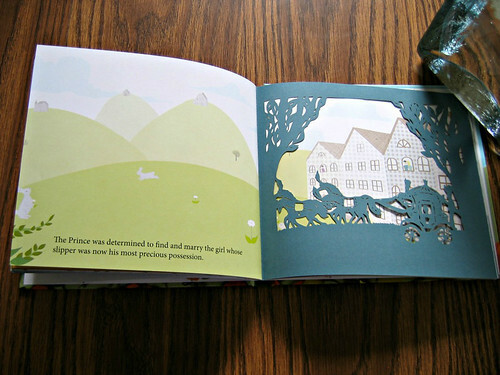 I can't think of any princess-obsessed little girl who wouldn't be entranced by the softly colored illustrations and tactile cut paper pages. 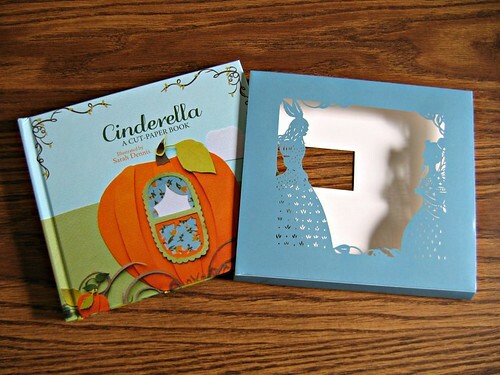 The book comes encased in a special sleeve and features twenty die cuts that richly complement the storyline. While the book is recommended for ages 3-5, I'm quite sure older children and any paper cutting enthusiast would admire it as well. IPG Trafalgar sent me a copy for this review and will also be sending Cinderella to one U.S. resident. Just leave a comment on this post as your entry. Earn a bonus entry by following @allthingspaper on Instagram and liking the Cinderella photo. Please be sure to include a way to be contacted within your comment. The giveaway will end on Sunday, March 22 and the winner will be announced here and on Instagram as soon as she or he has been contacted. Good luck! Oh my goodness what a GORGEOUS book! I would absolutely be over the moon to win this to read with my daughter. Thank you so very much for the chance to. What a wonderfully unique book! I love this type of paperwork - thank you! What an absolutely wonderful keepsake so very elegant. Thank you for a chance to win! Beautiful use of cut paper! A lovely and clever book. Thanks for all you do. This is such a sweet little book. Who doesn't love a fairytale! I have always loved the art of scherenschnitte, paper cutting and cutouts. Frequently, I cut out florals and horses but I have never delved into the complicated, artful cutting art. I really enjoy the intricacies of working with detail and will have to try a more difficult subject. Now lasers are used for some cutouts and turn out the most amazing cuts. As for me, I am planning to cut out a lovely Scherenschnitte scene for mother's day, frame it and present as a unique gift. My email is dressyourhorse@gmail.com. Gorgeous book! I love children's books and this one is very special! I think this looks like a fabulous book--one that any little girl would love!! i love to collect unusual books. This is one that I truly would love. 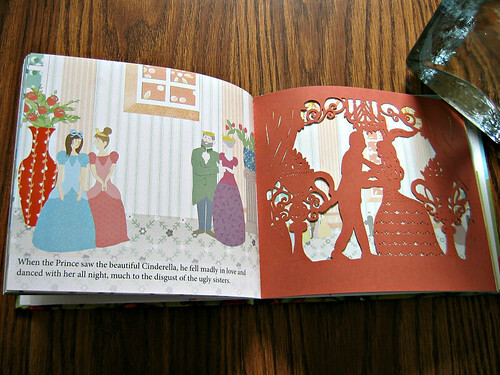 The story of Cinderella is classic and this is just gorgeous! This book is simply stunning. I would love it. I have one to create miniature skyscrapers. Thank you for the review and the giveaway. I have always loved the art of scherenschnitte, paper cutting and cutouts. This beautiful book would become a family treasure. I know a perfect princess for this book .... how wonderful! I LOVE Cinderella!!!! i have a whole china cupboard of cinderella!! My granddaughters would love to have this book. They love all the books I get for them and they like it when I read to them. Would love to win this for my grandchild. I didn't see that my comment posted so I am trying again. The book is beautiful. I would love to win this for my daughter! This looks like a book my Great Granddaughter would love to have in her Easter Basket. The giveaway has ended. Thanks for your interest in the book!